“Severe” staffing shortage leaves families without state benefits. On December 14, 2015, Dan Madrid, director of Delaware’s Division for the Visually Impaired (DVI), announced in an e-mail that his department would have to curtail services for Delaware’s blind and visually impaired students. The reduction itself was relatively benign. Those students receiving in-person consultative services through DVI–about 60 percent of the state 260 blind and visually impaired public school students–would now receive the same services via e-mail. The cause for the change, Madrid said, was a “severe” staffing shortage combined with a sudden spike in the number of students requiring consultations. The reduction would be temporary, lasting until DVI could hire a group of contractors to replace the sudden departure of a couple core teachers. Yet the move triggered strong reaction among advocates, in part because many believe the current predicament reflects years of neglect and inertia that has left some of Delaware’s most vulnerable students in need. Many argue Delaware’s services for blind students have long lagged behind those for other “birth mandate” disabilities such as deafness and autism. “If [blind students] could even equal what they’re getting that would be a step forward in Delaware,” Director of Special Education for the Brandywine School District Lisa Lawson said. A 2015 report, penned by a legislative task force on education for blind and visually impaired students in Delaware, found “serious challenges” in the level of service, and referenced “lack of available teachers” as a primary concern. Delaware uses an itinerant model whereby specialists visit students in their home school to help teach braille and translate class materials into more easily understood formats. The state guarantees one specialist for every 28 blind or visually impaired students, about double the national average, the report found. That was before the current shortage, which has left teachers scrambling and parents frustrated. At the moment, an estimated 25 percent of the state’s blind and visually impaired students aren’t receiving the full benefits to which they’re entitled, according to Delaware’s Division for the Visually Impaired. DVI–which is housed under Delaware’s Department of Health and Social Services, not the Delaware Department of Education–says it will account for missed hours of instruction once it hires emergency contractors. That may be little solace, though, to families like the Harringtons. Debbie Harrington’s 19-year-old daughter, Elizabeth, has been blind since birth and suffers from cerebral palsy. A year and a half ago the Harringtons grew so frustrated with the level of services in Delaware that they requested the state pay for Elizabeth to board at the Maryland School for the Blind in Baltimore (Delaware doesn’t have a school for the blind). Earlier this year, Elizabeth returned to her home school, Appoquinimink High School in Middletown, Delaware, in hopes of finishing her senior year at home. Already, though, the Harringtons are up against what they say are familiar challenges. The family requested Elizabeth receive one visit each day of the week from a teacher for the visually impaired, or TVI. Those visits are crucial, the Harringtons say. Without them, Elizabeth often can’t process class material or get started on assignments. DVI acknowledged Elizabeth’s needs, but said it could only offer longer visits three days a week during the staffing shortage. As a result, the Harringtons say, Elizabeth is struggling in her statistics class. If she doesn’t pass, she may not be able to graduate in the spring. Even before the shortage, some families report being denied services because DVI simply didn’t have the staff to provide them–not because the child in question didn’t need them. Lisa Lawson with the Brandywine School District remembers one case vividly. A teacher for the visually impaired told her and a family that, although the child needed extended school year services, lack of staff would prevent DVI from providing them. It’s difficult to isolate outcomes for Delaware’s blind and visually impaired students, and thus difficult to tell whether any of these shortcomings have hurt students in the long run. The most recent data supplied by DVI shows 17.6 percent of blind and visually impaired students are reading below grade level. Another 13.2 percent read at grade level, while 4.9 percent read above grade level. Those figures don’t account for the fact that many blind and visually impaired students have other disabilities. It also leaves out the 63.2 percent of students who are either too young to read or considered “non readers” because of severe cognitive impairments. Those numbers also gloss over the skills and dedication of Delaware’s teachers for the visually impaired. Small in number and stretched to capacity, Delaware’s TVIs earned near-universal acclaim from families, advocates, and officials interviewed for this story. Many work with students from the time they’re toddlers to the time they graduate, forging uncommonly strong bonds along the way. Students like Bryanna Robinson, a junior at William Penn High School in New Castle, Delaware, gush over their TVIs. Johnson also praises DVI for helping her land a summer internship. And in fact, many say the division, under new director Dan Madrid, is headed in the right direction. Overall, few dispute the quality of the instruction. There is a clamor, however, for more. 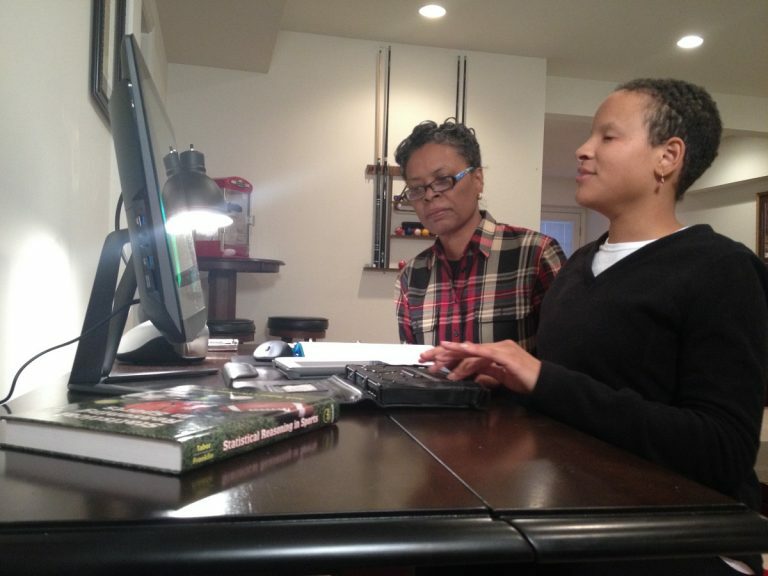 Many parents echo the sentiments of Takiyah Benson, whose only daughter, Tanealle Simpson, has been blind from birth.